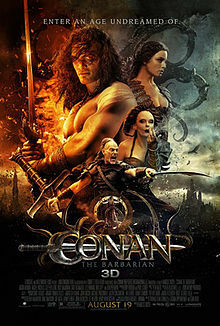 The 2011 remake of the 1980s Arnold Schwarzenegger film "Conan The Barbarian" left much to be desired. It paled in comparison to the original. Both films were too violent, but the remake simply goes to far in another display of Hollywood violence. The remake sans Arnold Schwarzenegger, stars Jason Momoa as the film's namesake. His mother is killed while pregnant with him, but he survives and perversely with a taste for blood, due to the manner in which she was viciously murdered. He is raised to be a warrior, but as he reaches adulthood, becomes a confused, lustful pirate. This film is one long reel of bloodshed and debauchery, coupled with a bad script. For the studio to spend $90,000,000 on producing this movie, plus another $20,000,000 in marketing and promotional costs, thus ending up in the red with $49,795,021, is just deserts for releasing this piece of filth.